An incredible achievement from Sony; providing diversity, exceptional animation and lots of laughs. Spider-Man has been a staple of Sony for many years now. It was Columbia Pictures, one of Sony Picture’s divisions, who released the huge blockbuster, and some would argue, the original modern-day Superhero film, Spider-Man, directed by Sam Raimi back in 2002. Since the release of that film, Sony have held tight when it comes to telling the stories of one of Marvel’s best-loved characters. Ever since Toby Maguire donned the famous suit, we’ve seen Andrew Garfield, and most recently Tom Holland, excelling in the role, but now thanks to Spider-Man: Into The Spider-Verse, we have a new and wonderfully diverse group of Spideys. If that sounds slightly difficult to get your head around, then don’t worry, I will do my best to explain. 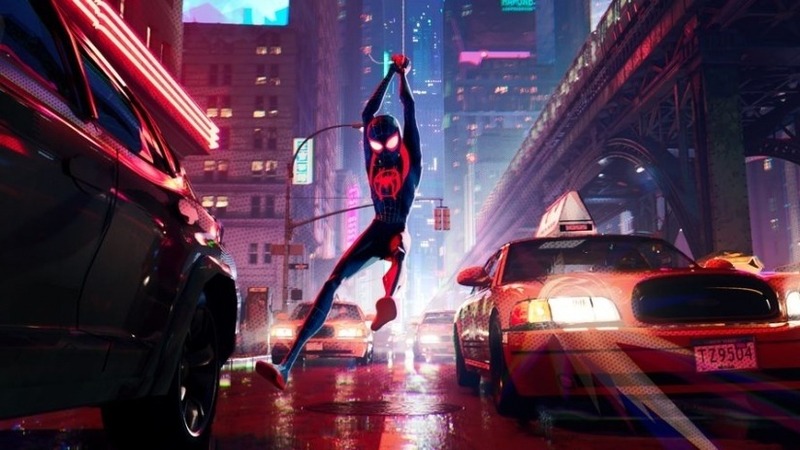 Spider-Man: Into The Spider-Verse takes place in the animated world of New York City and follows the street-wise, misfit teenager Miles Morales (voiced by Shameik Moore) who is bitten by a radioactive spider whilst working on some street art with his Uncle Aaron (Mahershala Ali) and as you may have guessed, takes on the characteristics of Spider-Man. Feeling rightly overwhelmed, Miles struggles to get to grips with his new powers and heads back to the underground where he was bitten and stumbles upon a fight between the Green Goblin and the original Spider-Man, whilst KingPin is attempting to create a rift in their universe to bring back his wife and child. Spidey saves Miles from falling to his death and suddenly realises that he is not the only Spider-Man, handing Miles the task of trying to destroy the software that is ripping the universe apart. The split in dimensions, however, pulls in yet more versions of Spider-Man and Miles is taken under the wing of another Peter Parker (voiced by Jake Johnson) as Miles and Peter attempt to complete the task that was given to Miles. So, as you can imagine, there are a lot of Spider-Men / Spider-Women and even a Spider-Ham in this film and on the surface of it, you’d be forgiven for thinking this may get over-stuffed and messy, but every version of Spider-Man is wonderfully diverse and different. Spider-Gwen (Hailee Steinfeld), for example, is dragged into Miles’ universe and uses the painful memory of losing her best friend to become the perfect badass female Spidey you could imagine. Jake Johnson’s Peter Parker is the reluctant super-hero who has fallen out of love with the job, divorced from his wife Mary-Jane and happy to eat pizza instead of working out and the introduction of a futuristic Spidey, Peni Parker (Kimiko Glenn), who takes over the role from her father who died whilst piloting the SP//dr suit is again, a wonderful addition to Miles’ universe. For those who are still struggling to take it all in, don’t worry, there has also been a lot of thought going into breaking up the heavy Spideys with the straight-up lovable and laughable Spider-Ham (John Mulaney), who is quite literally a hog-inspired Spider-Man and the intense and moody Spider-Man noir, voiced perfectly by Nicolas Cage. It might sound like a mix and match of Spideys, but all the characters bring a lot of life to this incredible universe. To fit all these versions of Spider-Man in, would require a huge amount of thought and cleverness when it comes to the writing and thankfully, the film has exactly that. The story, created by Phil Lord and written by Lord and Rodney Rothman could have been a confusing mess, but the punchy dialogue and the witty take on their universe means that Lord and Rothman have produced arguably the smartest, funnest and funniest screenplay of the year. Although, Miles’ ‘becoming Spider-Man’ was a little too thinly thought out, and the big fight scene at the end was somewhat too long and overdone, for me at least, the writing and the animation ensures that Spider-Man: Into The Spider-Verse manages to combine all the vital elements of classic comic book story-telling with a superhero film and it is an absolute joy to watch. There are some truly very funny moments mixed with some very poignant scenes and whilst I really didn’t know what to expect before going to see Spider-Man: Into The Spider-Verse, I left knowing that this is certainly the best take on an origin film, in a hugely over-crowded genre that I have seen. Spider-Man: Into The Spider-Verse is released on 12th December by Sony Pictures Releasing.